New season, new skating, new practices! My new motto for this year. As long as my knee holds out, I am off to a good start. I just started taking private lessons again and I am back to the grind of practicing those silver moves. I have been taking 2 days off in between skating sessions and seeing a massage therapist. Those two things seem to keep my knees in better shape so far. Stretching before and after skating helps immensely to keep my IT band from getting too tight. Paying attention to how I feel off the ice has really helped me control how much pain I feel on ice. However, I keep my skating to 2-3 days a week right now. Sessions can be 1 1/2 hours long, sometimes 2 hours and my body seems to respond ok to that. Anything more at the moment and my knees seem to stiffen up and feel overworked. I started lessons up last week because I finally feel like I can comfortably skate enough sessions to get a benefit from them. I have found on occasion that advil helps immensely to keep my knees from becoming to stiff or painful but I only do this once in a while. I’d rather not depend on advil to skate. I have also started taking GNC’s Women’s Mega Joint vitamin pack. I did this last year when I was not skating and I noticed a huge difference in mobility. It’s glucosamine, chondroitin, fish oil, and a multi-vitamin pack. I thought it might have been in part due to not skating but I was running a lot and I felt a lot less pain doing that. So, I just started taking these again and I noticed an immediate difference in stiffness and pain. Everything seems to be working smoother where my knees are concerned. I also feel a lot more energy. I will update on how my knees feel in the coming weeks as I skate more. For now, I’ve had two lessons that I want to share. Lucky for all they are all about power pulls and cross overs. So exciting, right? HA! – you want to make one line with your free leg hip up so you can balance better on your skating leg. – keep the leg very close but do not touch one leg to the other. Touching one leg to the other is like throwing yourself off balance when you bump into something or someone. -Keep Your Head Up and Core tight. Switch feet halfway down the ice to start on outside edge of left foot. Here is my crazy sketch and basic outline (and yes, this mess is what is looks like inside my mind…bwahahaha). These, much like my flip, are terrible. I have a lot of issues with the left knee, getting down low enough and generating enough of an edge or curve to power a continuous power pull on my left is a challenge in and of itself! However, I have seen in a short 3 sessions a huge improvement. I can actually make it down the ice now instead of coming to a standstill halfway down the ice. Yes, I was a snail and now I am like a turtle coming down the ice 😉 A turtle is faster than a snail, right?? I also learned a basic warmup exercise which I will use every time I get on the ice now, I believe part of it is on the bronze test. Alternating forward inside edge cross overs: Start with a few basic strokes, toes pointed, knee bend, then deep crossover, free leg held extended before crossing under then a deep inside edge hold. 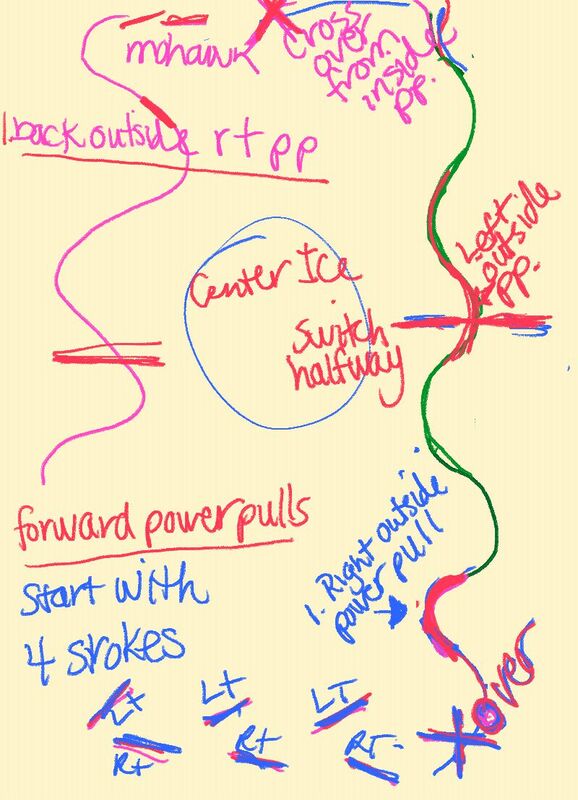 Continue down the ice alternating cross overs. Alternating Back Outside Edge Cross Overs: Mohawk, back outside edge hold, cross under, hold, alternate, repeat and then at the end of the pattern hold a nice landing position. One thing that my coach noted was head position. If you can control where you are looking then you can control your edges or body position on the ice. The best skaters can control where their head is when skating. Something we hear and kind of know already in theory but we don’t really think about it. So I am really working on controlling where my head is on my cross overs and really looking where I am going. I look into the circle on these and hold my back arm up and way to the back, as far back as I can get my shoulder. I hold each edge and keep a very deep knee bend and then push under. This all very rudimentary but I think that my skating is going to go from small quick sloppy pushes to long, steady, and powerful pushes. I’m hoping to really dig deep into the ice finally and improve on my overall skating. I just hope my knee lasts! Ta Ta.. till next time!